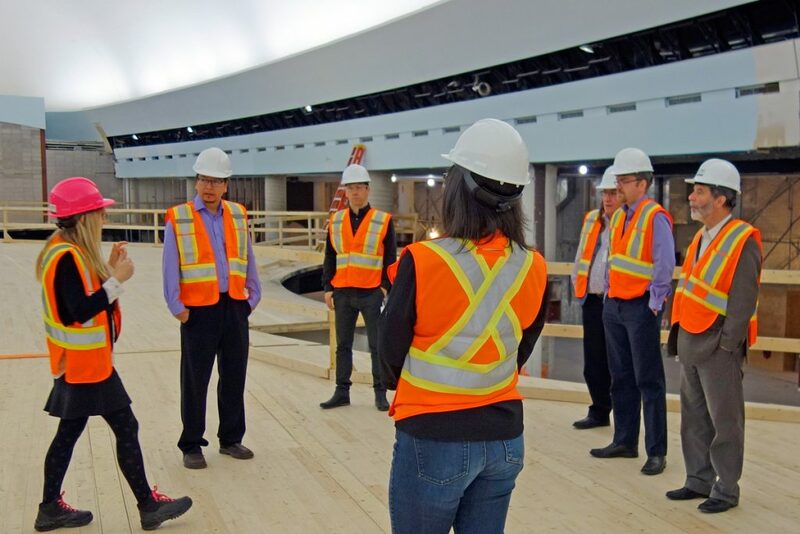 Members of the Aboriginal Advisory Committee visited the Canadian History Hall in construction during a meeting with Museum staff. Canadian Museum of History, photo C. O’Sullivan. From the very beginning, the Canadian History Hall team has sought expert advice on developing the Hall’s content. Many scholars and Indigenous Elders and leaders have helped us along the way. In 2013, we started with six committees to advise us: a general committee for the overall development of the Hall’s content, three committees responsible for distinct periods in Canadian history, an Aboriginal Advisory Committee and a Women’s History Committee. We have benefited greatly from their specific expertise and perspectives. In the summer of 2014, we streamlined the six committees into the two that continue today: the General Advisory Committee, with one new member nominated by the Women’s History Committee, and the Aboriginal Advisory Committee. You’ll find a list of all our committee members here. One of them, John Moses, an Aboriginal veteran, PhD candidate, and a descendant of three generations of residential school survivors, spoke to us recently about why it was so important for him to get involved in the Canadian History Hall project. Q: What motivated you to participate in the Canadian History Hall project? A: As a member of the Delaware and Upper Mohawk bands of the Six Nations of the Grand River Territory, as the son, grandson and great grandson of residential school survivors and as an Aboriginal veteran, I am very much concerned with building public awareness and providing critical Indigenous perspectives concerning Canada’s national development. Q: When you are giving advice, what aspects are most important to you? A: My own approach to guiding my input into the Canadian History Hall redevelopment project is that — whether in terms of land, courage, sweat, tears or spirit — Indigenous peoples and Indigenous issues define Canada. Q: Why did you want to become involved with this project? A: My late father, Russ, a residential school survivor and a Korean War veteran, was deputy commissioner general of the groundbreaking Indians of Canada Pavilion at Montreal’s Expo 67 during Canada’s centennial year celebrations. Now, by participating in this Canada 150 project here at CMH, I like to think that in some small way I am carrying his important work forward, while providing a legacy for my own daughter, Quinn Kateri, to one day carry forward in her own way and time, and indeed for seven generations and beyond.